Woodbridge, United States - February 27, 2019 /MarketersMedia/ — A polar vortex has recently brought severe cold temperatures to the Midwest and Northeast of the US. The temperature dropped to a record-breaking -30 degrees in certain parts of the US. In Chicago it was recorded at -23, while Minneapolis reported at -27. As a result of the snowstorms and brutal cold battering these regions, multiple vehicle collisions have occurred. Reports showed that over two dozen vehicles were involved in accidents. With the snow squalls causing series of vehicular accidents, car owners were advised to store first aid kits inside their automobile. Adventure gear company, Surviveware, offers products that help manage wounds and injuries sustained on road trips, even those brought about by winter storms. 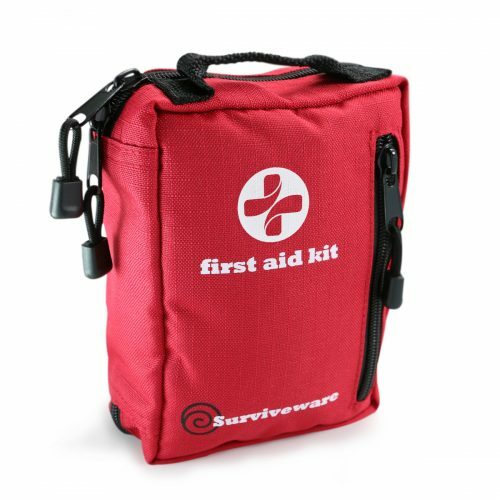 Surviveware’s Small Travel First Aid Kit is a lightweight and portable package that provides emergency care supplies to kit owners who become involved in winter-related vehicular accidents. Surviveware’s kit holds 100 essential items for treating a variety of wounds and injuries sustained from travel and road accidents. This travel first aid kit holds high-quality bandages, adhesives, wraps, and steri-strips to help patch up scrapes, cuts, and abrasions. Apart from that, other supplies such as safety pins, splinter probes, eye pads, shears, tweezers, a triangular bandage, an emergency blanket (ideal for staying warm in a stranded car, or using as a reflective signaling device), and a removable CPR kit are also included in this pack. These supplies are stored inside a 600D polyester pouch, an ideal material for first aid kits due to its water-resistance and rugged strength. The kit can float on water and keep its contents despite the freezing weather. A favorite feature of the Surviveware Travel First Aid Kit is that it’s stored in organized compartments for easy retrieval and storage. The piping of the compartments is labeled to provide ease in identifying the supplies stored in the pockets. The Surviveware Small FIrst Aid Kit continues to be a solid and dependable addition to motorists’ cars. Tim, an Amazon customer, shared his thoughts about this small first aid kit, writing, “This is a fantastic little first aid kit. The kit is wonderfully organized and labeled, eliminating that necessity to dig to find what you are looking for in a hurry. Nothing beats having a ready first aid kit in your car, should something untoward happen on the road. Grab a Surviveware Small First Aid Kit today and keep your travels safe and worry-free. Surviveware is giving away 20% discounts to the first 100 people who purchase this kit. Don’t miss out on this limited time offer! Buy your kit today by clicking here.